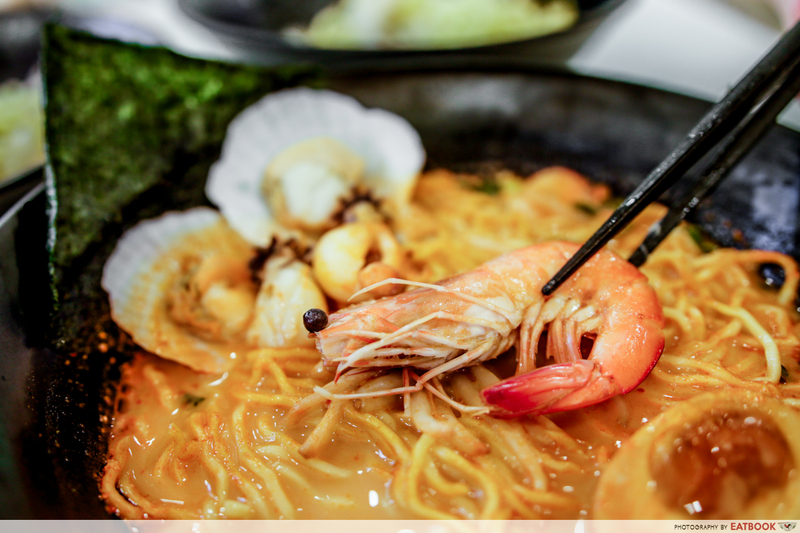 Update: Wakon Ramen has moved to Blk 28 Dover Crescent, #01-97, Singapore 130028. 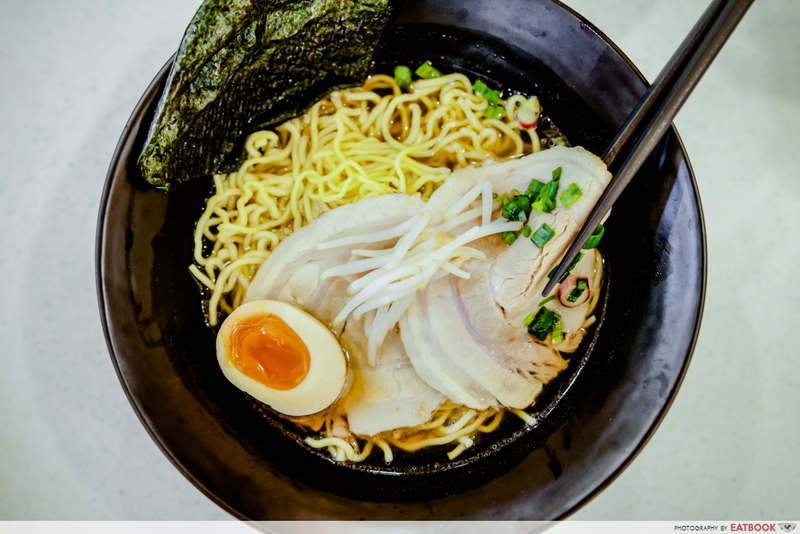 I’m not much of a fan of noodle dishes, but there’s something about the luscious broth and creamy flavour of a tonkotsu ramen that is oh-so-comforting. 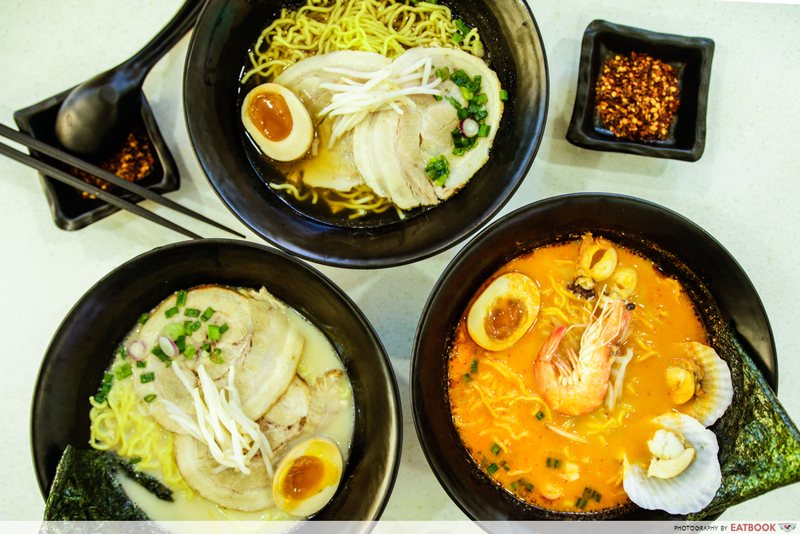 From customisable ramen I’ve enjoyed at hole-in-wall joints to creative bowls in restaurants, it seems to me that whatever my preference is on a certain day, there’s bound to be a bowl that can satisfy me. 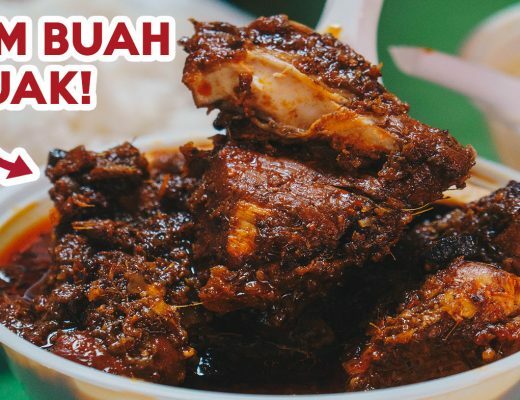 In spite of the number of joints that have popped up, I try to ignore my ramen cravings because my wallet will hurt if I satisfy myself whenever I feel like it. Ramen specialty hawkers are hard to come by. 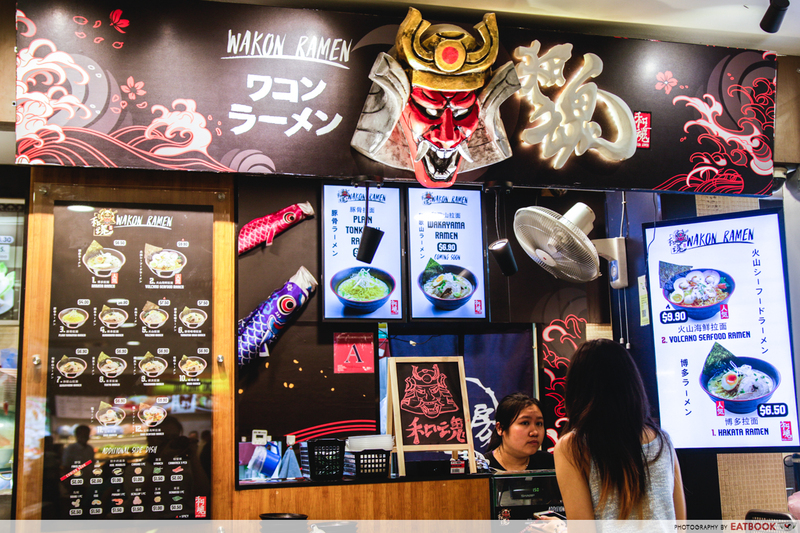 In the last two months or so however, Wakon Ramen has been selling affordable ramen bowls in an air-conditioned kopitiam in Pasir Ris. 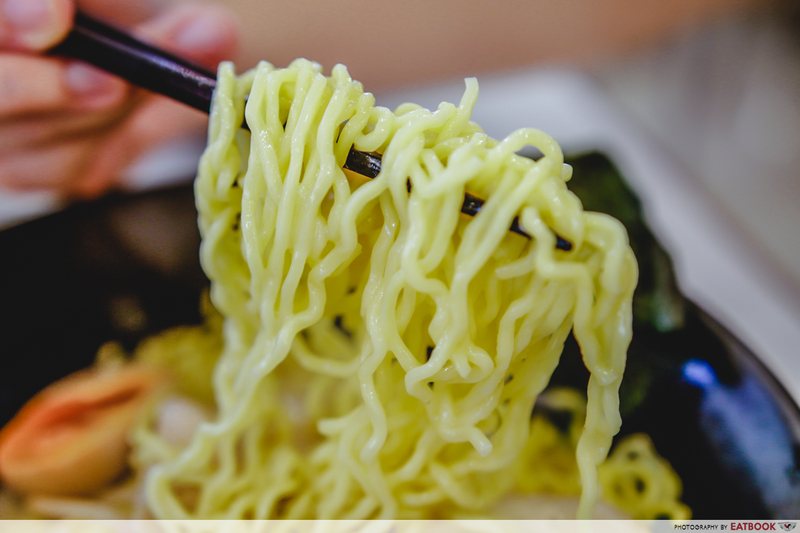 Wakon Ramen has a menu of 12 choices, and we easily decided on their two most popular dishes. 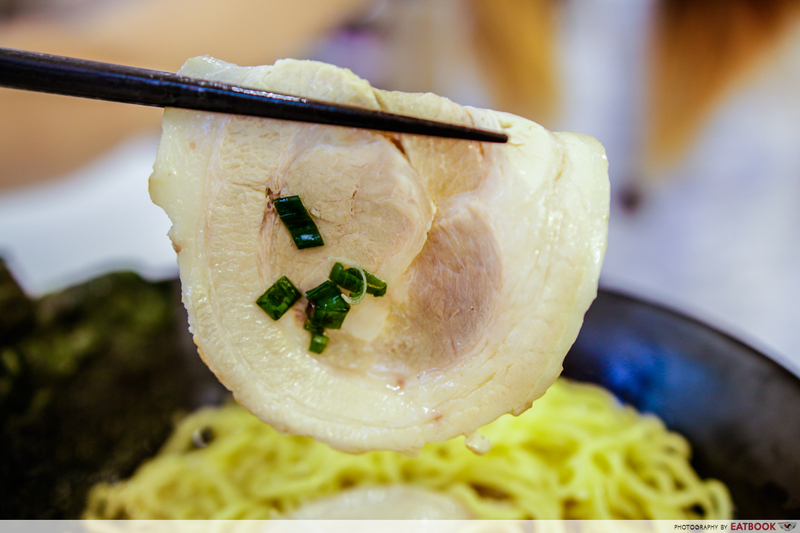 Hakata Ramen ($6.50) is yellow ramen served in cream-coloured tonkotsu broth, topped off with two large slices of chashu, half an ajitsuke tamago (seasoned egg), bean sprouts, scallions, and a sheet of seaweed. The pork broth was enough to cover the noodles, but was runny and thin. Being used to a rich and robust base, I thought it tasted too light and lacklustre from the lack of pork flavour. It wasn’t too salty or greasy though, and there were bits of minced pork swimming in the soup. The two large slices of chashu had a generous amount of fats. 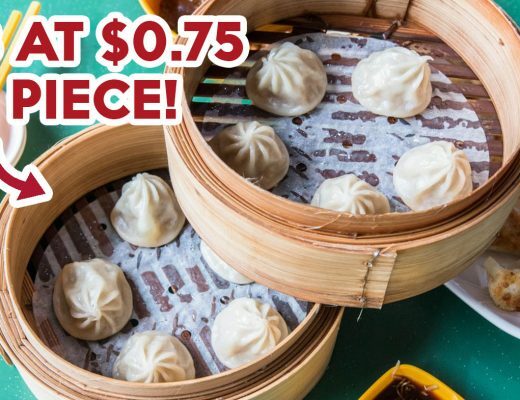 I picked up one, and the soft piece hung from my chopsticks. It was tasty with a meaty flavour, and mostly tender while retaining some chewiness. Though it didn’t melt in my mouth, it didn’t leave me complaining. The egg had a beautiful yolk that was slightly runny. Though it wasn’t the best I’ve had, it was savoury and enjoyable. 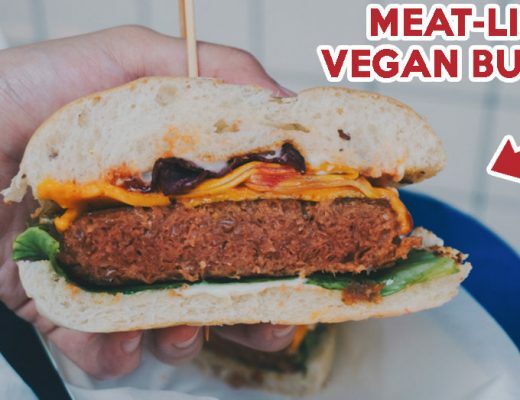 I couldn’t keep myself from gobbling it down in two quick bites. Their round and curly ramen was medium-thick, and was enough to make a filling meal. They were slightly soft, though not overcooked. Unfortunately, their taste was boring since there wasn’t much umami flavour in the soup to soak up. Wakon Ramen’s two popular signatures are Hakata Ramen and Volcano Seafood Ramen ($9.90), but we were also recommended their Tokyo Ramen ($6.90), and Tonkotsu Miso Ramen ($7.50). Tokyo Ramen has the same toppings as Hakata Ramen but comes with a shio-based broth. The ingredients were just as tasty, showing that Wakon Ramen is quite consistent. I would gladly add on a full egg for an additional $1.50 if I were to revisit. The clear broth was just as salty as the tonkotsu broth but with a lighter finish. I personally preferred the previous bowl. 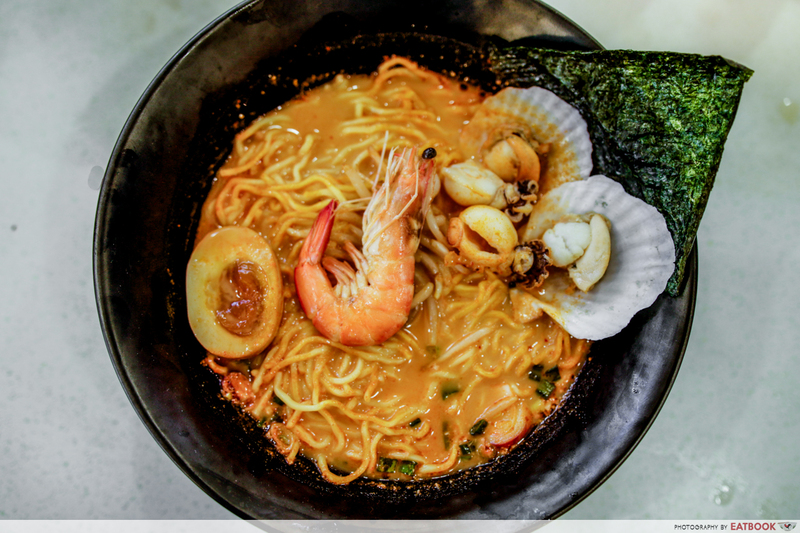 Volcano Seafood Ramen is the priciest menu item but also the most popular. We definitely saved the best for last. 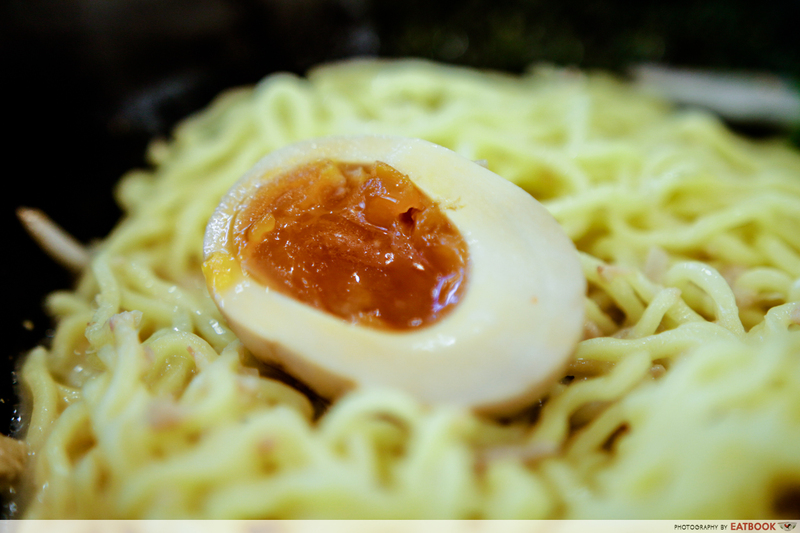 Wakon Ramen mixes chilli paste into tonkotsu broth according to whether you want less, regular, or more spiciness. Then they decorate your bowl with a medium-sized prawn, two scallops, two baby squids, and a sheet of seaweed. Feeling like I received a challenge, I opted for more spiciness without hesitation. I started choking on my first sip of red soup, and regret instantly started to surface. Given the mild tonkotsu base, I did expect a strong chilli taste, but this was overpowering. Wanting to prove my mettle though, each slurp became increasingly addictive, and I finished this broth to its last drop. The fresh prawn was sweet and crunchy with firm meat. The two scallops were a bit stale and hard to de-shell, so I wasted quite a bit of meat. The ajitsuke tamago was, again, well-executed and satisfying. The baby squids were slightly overcooked and chewy, but didn’t ruin my experience with this dish. To be honest, I was disappointed there wasn’t any chashu. At $1 per piece, it would have been a great add-on. Out of everything I tried, this is the bowl I would want to repeat. 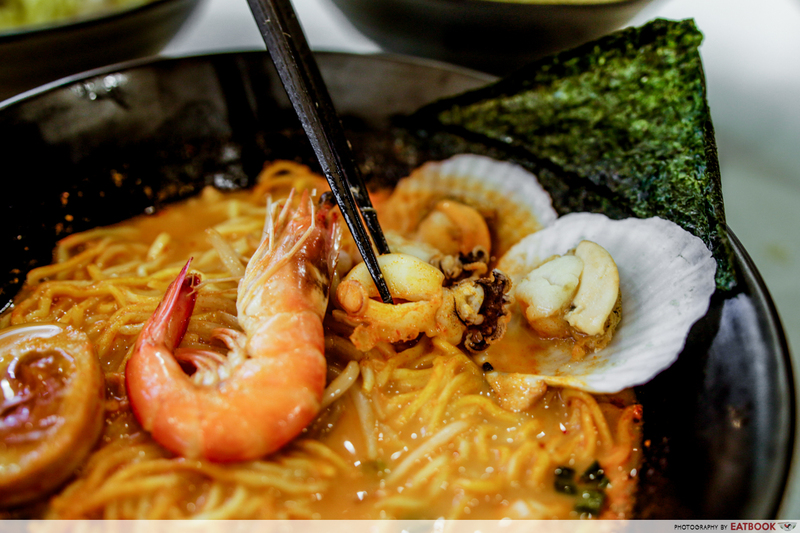 If seafood is not an option, they have Volcano Ramen ($7.50), which comes with two slices of chashu and half an ajitsuke tamago instead. Otherwise, they also have Plain Tonkotsu Ramen ($4) for you to customise with a variety of additional side dishes which cost $0.50 to $2. 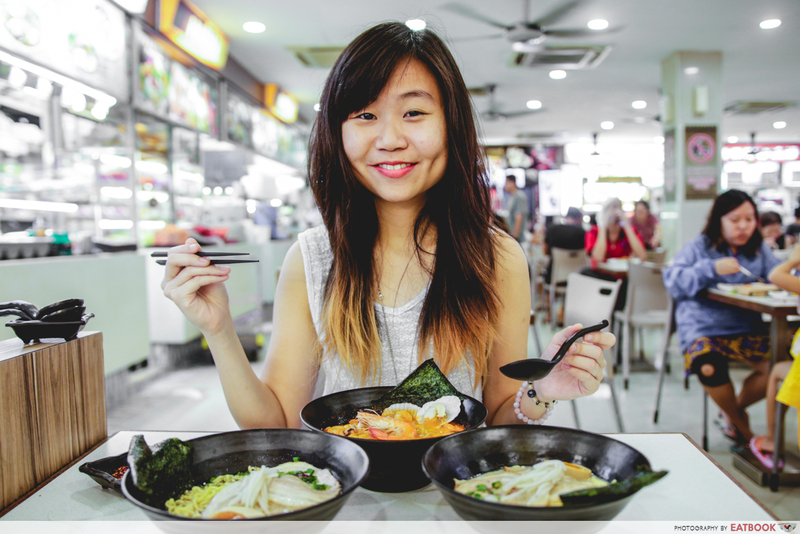 Wakon Ramen is located in Coffee Express 2000, which is a kopitiam a few bus stops away from Pasir Ris MRT Station. 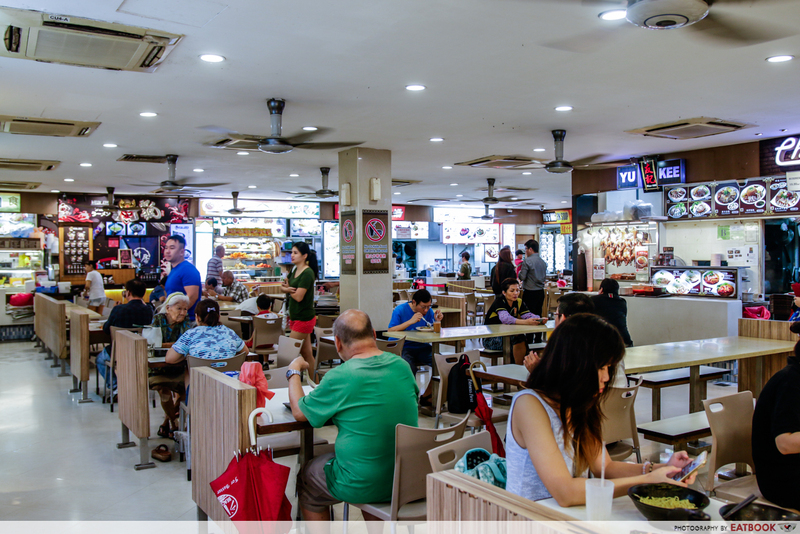 You can easily spot the stall from its black theme and elaborate decor. Ordering is simple and you can ask the friendly staff for recommendations. The coffee shop looks slightly old but is generally clean and cooling. The indoor seats have air-conditioning which might be stronger at some parts. 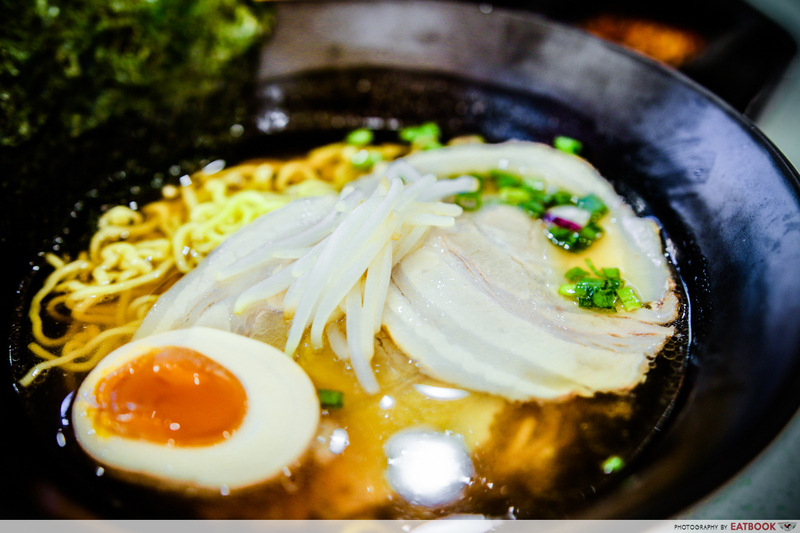 At the mention of ramen, most of us have a few places that pop into mind, and comparison is inevitable. 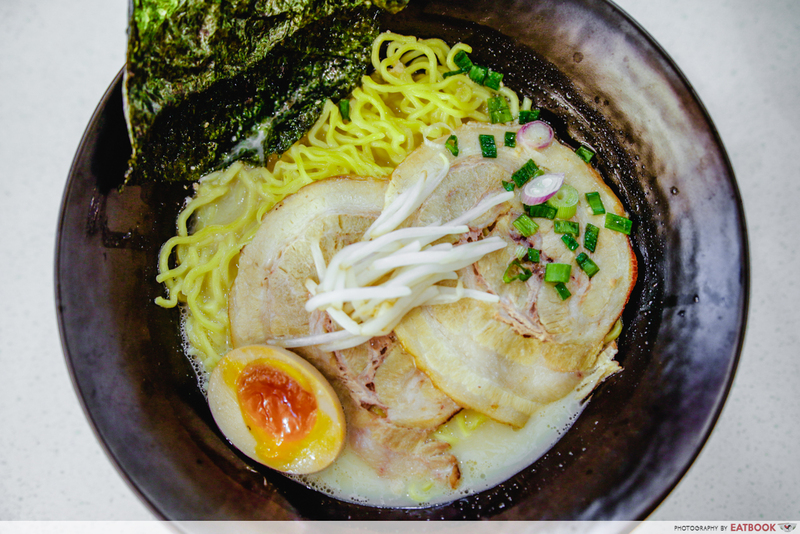 At Wakon Ramen, there were hits and misses. I liked their ingredients, but the seaweed sheets quickly curled up from heat and went soggy. We can’t expect every component to be perfectly executed, especially since they’ve only just opened. Still, I’m sure they will be a strong competitor against restaurants if they could improve on the flavour of their broths. Luscious soup is, after all, what makes or breaks Japanese ramen. Wakon Ramen is not a halal eatery.